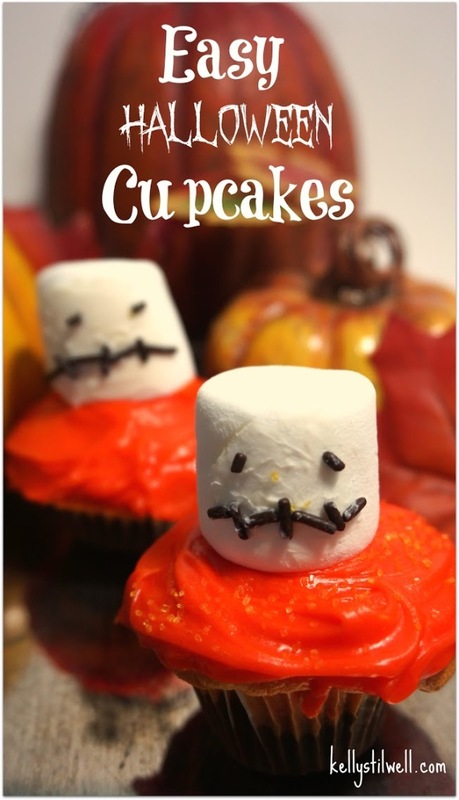 4 Ideas for Easy Halloween Cupcakes! I really love the holidays, and making Halloween cupcakes has been so much fun! My daughters and I brainstormed to come up with some fun designs, and all of them are so easy! What started this idea was a box of cake mix. I was at the grocery store and saw Duncan Hines Autumn Velvets Limited Edition cake mix and had to try it! No, this is not a post for Duncan Hines. I just thought the two flavor cake mix looked good! There are no directions for cupcakes on the box, but since when do I follow directions anyway, right? No judging. I made the cake mix according to the directions and put the orange batter right on top of the chocolate. I used mini muffin tins as we prefer bite-sized desserts. You could also take a knife and swirl each cupcake before baking to make them marbled. We all agreed the cake was delicious! 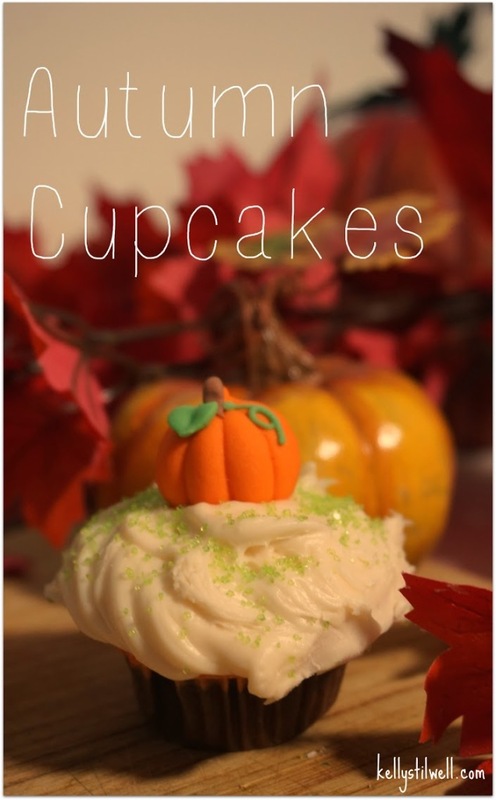 I bought cream cheese icing to top the autumn cupcakes, along with green sprinkles and sugar pumpkins from Michael’s. Didn’t they turn out cute? Easy, too! 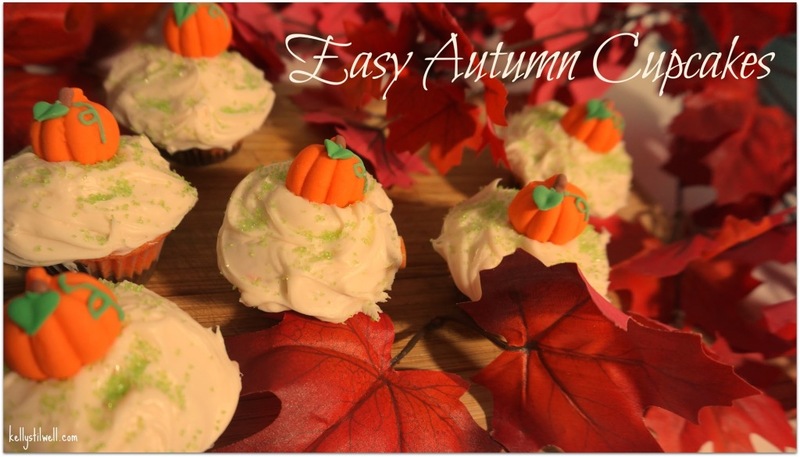 Decorate around the cupcakes with some fall leaves and you’ll have a beautiful tablescape. For the next batch of cupcakes, I wanted to get spooky, so I frosted them orange. This time of year, you can buy orange frosting, but if you don’t like the dye, just find a natural food coloring and tint the white frosting. Using canned black icing, I went across each cupcake three times and then connected the lines to make a web. For the cupcake with the spider, I used a licorice bite for the body, strips of licorice for the legs, and placed pieces of yellow sprinkles for eyes. Creepy, right? I also bought some cute little signs to add a festive look to my table. For my third group of cupcakes I decided to make ghosts, also found at Michael’s. I swear – they have so many adorable Halloween ideas! I wish I had more hours in the day to try them all! I frosted these with orange again to match the candy corn the ghosts are holding. So fun! Finally, I pulled out marshmallows, one of our favorite treats. I decided to top this last batch of cupcakes with a monster. You can see how I made the mouth and eyes with chocolate sprinkles. I wasn’t sure how it would look, but I think they turned out so cute! I also added yellow sprinkles just to give the cupcakes an extra pop. This just goes to show you how much fun it can be to just get in the kitchen with your kids and play around! I’d love to see what you do with Halloween cupcakes or other desserts! Please share in the comments! Check out my Halloween Treats and Halloween Appetizers, too! And if you’re looking for Halloween Decor, we’ve got that, too! I need to bring cupcakes to my granddaughter’s pre-school for a Halloween party and you have given me great ideas on how to decorate them!! Very cute cupcakes! Thank you so much for linking up to Dare to Share, you are today’s Dare to Share Feature of the Day! 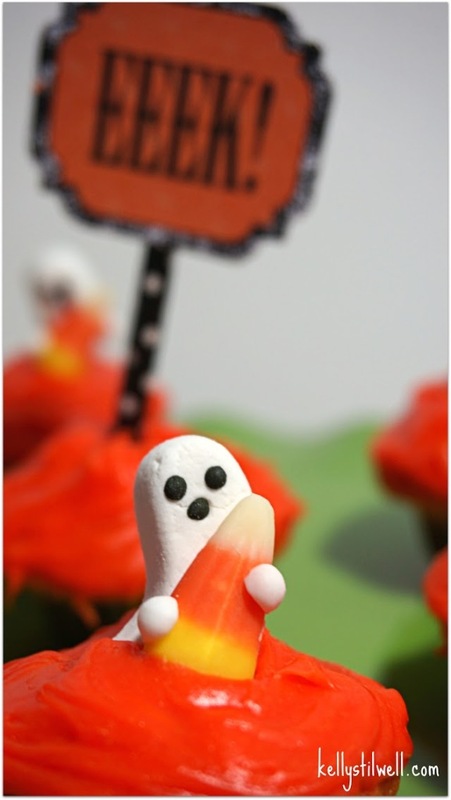 Oh my goodness the little ghosts with candy corn are precious!